We are a congregation of the Presbyterian Church in America which is a conservative-reformed-evangelical denomination whose motto is: "Faithful to the Scriptures. 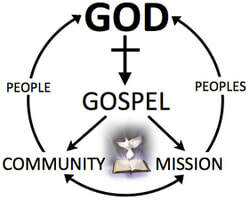 True to the Reformed Faith, Obedient to the Great Commission of Jesus Christ." To gather a scattered people into a church community of Kingdom-minded disciples. All of these centers driving us into a community in mission that brings people and peoples (of the whole world) back to God. Suwanee is the small town where both of our pastors’ families currently live. Our families love it here. In fact, it is a great place to live, especially for young families. Kiplinger.com (2012) called Suwanee “One of 10 great cities to raise your kids.” Yes, Suwanee is very family friendly – with great schools, public parks, low-cost of living and a high quality of life. This is the reason why the population of Suwanee has gone from 2,412 in 1990 to 15,355 in 2010. Asian Americans play a significant role in that growth. Asians are currently 18% of the population. The largest Asian group is Korean. We don’t want to idolize the family. Rather, we want to see a God glorifying church that can effectively minister to the whole family so that the whole family can glorify God and be a impact for Christ in the community. In our day of moral confusion, especially about God, marriage and family, we need more biblical churches that will help people grow in their faith and in healthy God-centered marriages and family life. Of course we want to reach out beyond Suwanee, the Asian community, and the family. We want to be a church that is grounded in the Truth of the Gospel and abounding in Grace to all people for His glory.